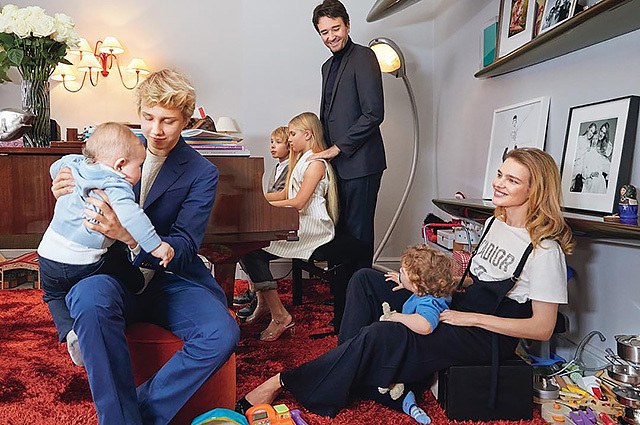 Famous Russian model Natalia Vodianova and her husband, a French businessman Antoine Arnault decided to spend the Christmas holidays just together. Judging from the photos published on Instagram, the couple left the children in France, where they currently live, and flew to sunny California. Earlier supermodel asked followers how they planned to spend the upcoming holidays. Vodianova later showed a funny picture with the 11-year-old daughter Neva. In the picture, shared to Instagram, Mom and daughter are seen wearing the same sweaters and lying under the Christmas tree. Natalia joked that these are the consequences of their holiday overeating. Now the model has decided to pay attention to her husband. The couple went to the US, Palm Springs, to spend romantic time. Celebrity already shared a couple of shots from the trip. 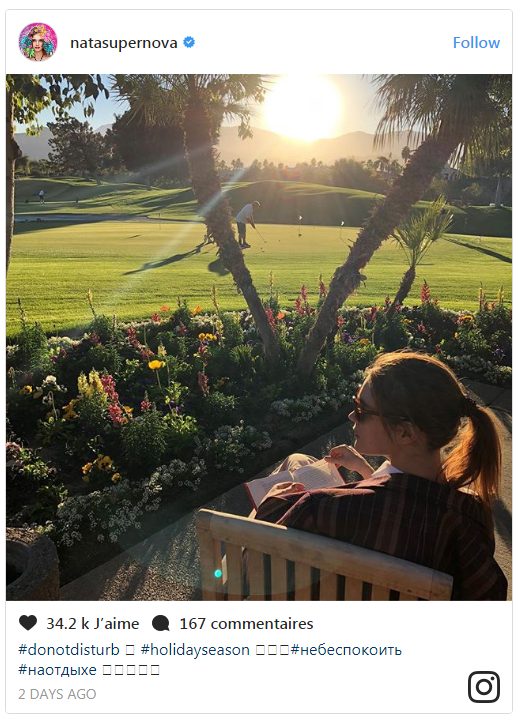 In one photo the couple traveling in a convertible, but in the other - Vodianova is seen sitting under the palm trees next to a golf course and reading a book, while Antoine Arnault enjoys the game. Recall, the French businessman became the second husband of a Russian supermodel. Previously Natalia was married to British aristocrat Justin Portman. From him she has three children: sons Lucas and Victor and daughter Neva. In 2011, the mannequin started having affair with Arnault and gave birth to two sons - Maxim and Roman. Natalia Vodianova and Antoine Arnault decided to arrange a hot and sunny Christmas break and went to Los Angeles. 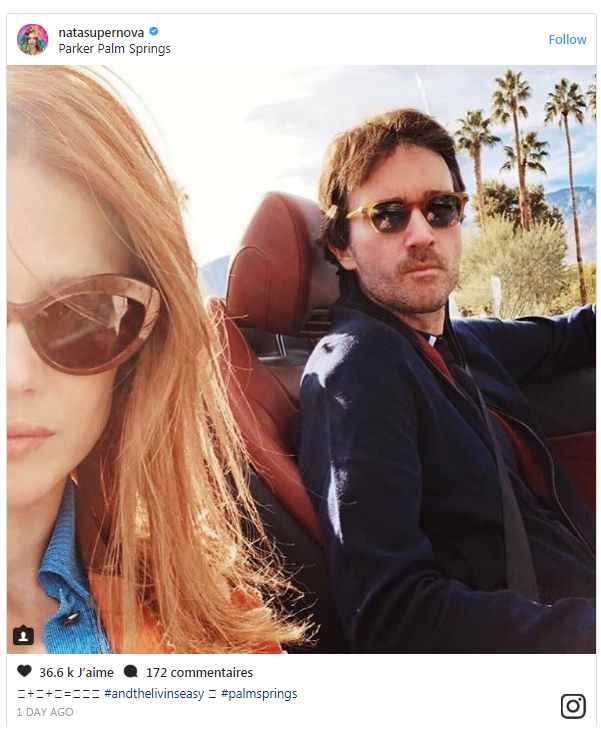 Natalia and Antoine, judging by the pictures of Instagram-account, traveled to California in a convertible with an open top and admired the mountain tops, palm trees and sunsets. One of the stops on the path was Hotel Parker Palm Springs, where Antoine was able to play favorite golf, and Natalia finally carve out a little bit of time to read the book - romance! Natalia Vodianova decided to make a gift to her followers on the eve of holidays. 35-year-old Russian supermodel and philanthropist has shared a rare picture with her lover Antoine Arnault, made far from the gray Moscow: the couple decided to celebrate the New Year in sunny Los Angeles. Of course, fans appreciated this New Year's gift from Natalia and Antoine: the picture has clocked up a staggering 18 thousand 'likes' and about 100 comments with compliments and wishes for the New Year since being posted a few hours ago. Recall that this summer the couple celebrated the sixth anniversary of their relationship. On that day, Natalia arranged a surprise for Antoine: took him to St Andrews (United Kingdom), which is one of the best golf courses. When Natalia does surprise you on the sixth anniversary of relations and takes you to St Andrews to play golf at The Old Course, it's unforgettable! - shared his impressions a French businessman.